In student film-making, it can be easy to fall into the trap of thinking that you won't get anywhere without a unique USP. Films like The Blair Witch Project managed to set new standards in cinema, and as a result changed the attitude towards student filmmaking forever. Most of the time, it's not worth tying to reinvent the wheel, but every once in a while something comes along which does, and succeeds. 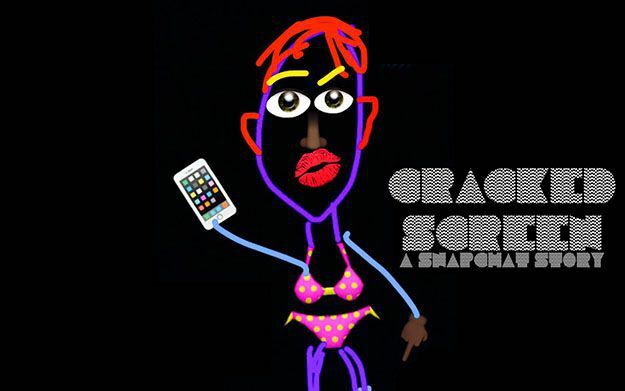 Cracked Screen is one such example, and the way it chooses to approach the narrative is through Snapchat. Through seven minutes, budding director Trim Lamba guides us through a series of Snaps taken by a young woman in London, the kinds of Snaps the average user sees dozens of times a day, at least at first. At around the halfway mark, things take a turn for the disturbing, but because you've been guided through such familiar, comfortable territory up to that stage. Tension in a normal film is softened, because you're expecting it, but watch a sinister situation unfold through the lens of Snapchat, and it takes on a completely different shape. From Friday, Cracked Screen will feature as Vimeo's short film of the week, but until then you'll have to settle for the 30-second trailer. It's certainly not the first film to use social media as a basis, but it's the first to encapsulate a story in Snapchat like this. It won't be the last.